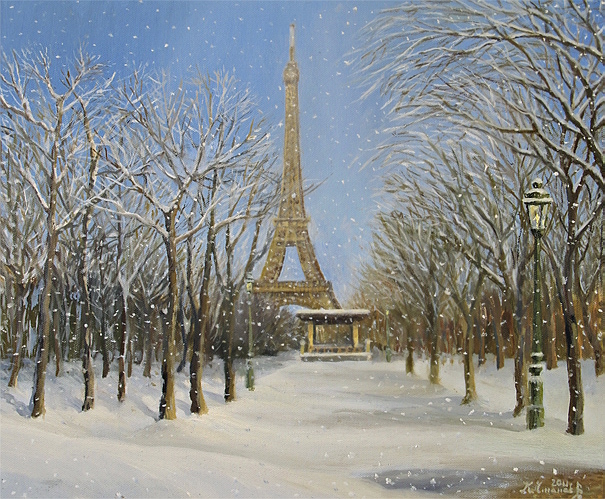 New painting is added to section "Available pictures", canvas named "Ice Glitter". The contemplation of the deep snow in the mountains brings a sense of spiritual purification and inner peace. There you hear the silence, catch the scent of frost and the snowy crystals dance, bathed in cold brilliance. 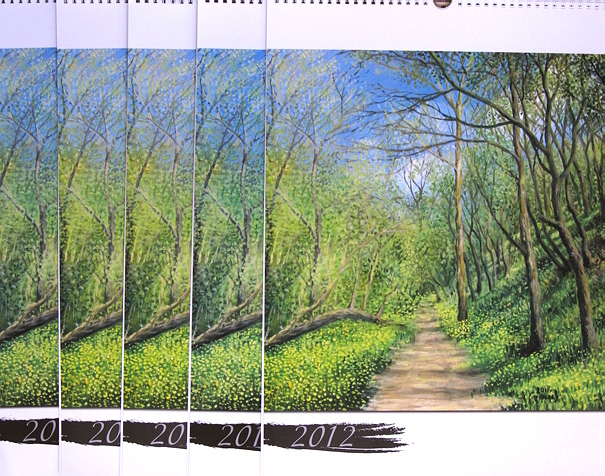 The first five art collectors who will buy a picture from kirilart.com in 2012 will receive a luxury wall calendar (12 pages + cover) presenting the future 12 months through Kiril Stanchev's eyes. New painting is added to section "Available pictures", canvas named "Beyond Silence". The forest near the sea coast in one of the last smiling autumn days - a day in which seems like you've passed an invisible boundary to enter a place beyond silence - a world of immense beauty and tranquility. попадаш отвъд тишината - свят на красота и безмерно спокойствиеГората край морския бряг, в един от последните усмихнати дни на есента - ден, в който сякаш престъпил невидима граница попадаш отвъд тишината - свят на красота и безмерно спокойствие. 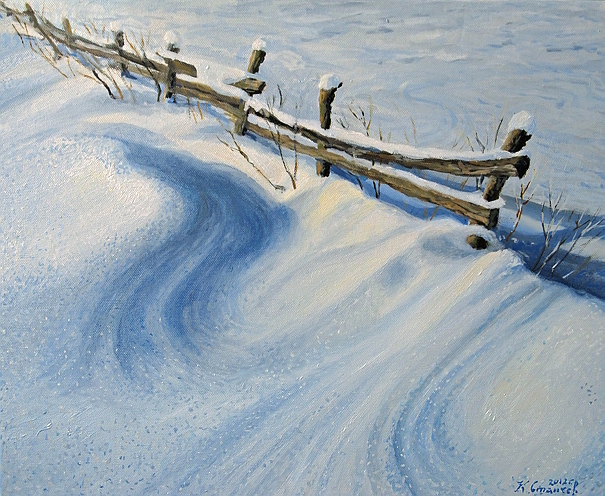 New painting is added to section "Available pictures", canvas named "At The Doorstep". Stepping at the doorstep of the monastery gates feel like going into parallel reality - a world filled with humility and nobility. 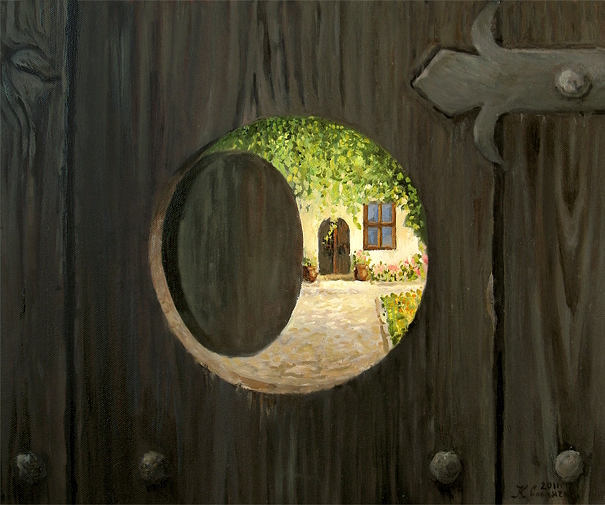 Canvas "At The Doorstep" presents detail of the entrance of Petropavlovski (Lyaskovski) monastery. 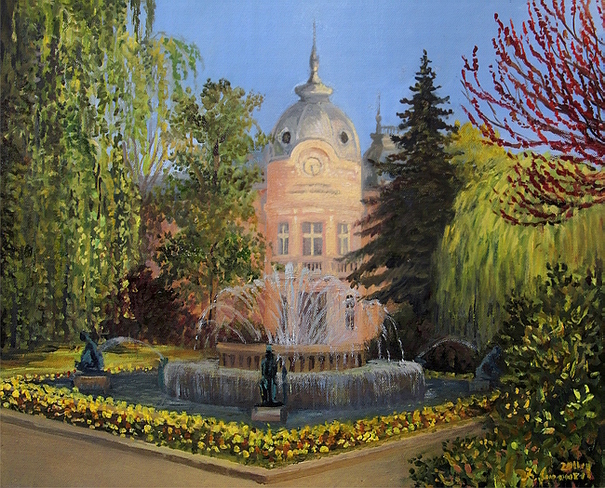 New painting is added to section "Available pictures", canvas named "Lyuben Karavelov Library". Today I'm presenting a subject from my home town Russe - The library Lyuben Karavelov with the fountain and garden in front of another landmark building in town - the History Museum, better known as the Palace of Battenberg. Nice week everyone! емблематична сграда в града - Историческият музей или както е по-известна Дворецът Батенберг. Хубава седмица на всички!Днес представям сюжет от родния Русе - библиотеката Любен Каравелов, с шадравана и градинката пред друга емблематична сграда в града - Историческият музей или както е по-известна Дворецът Батенберг. Хубава седмица на всички! 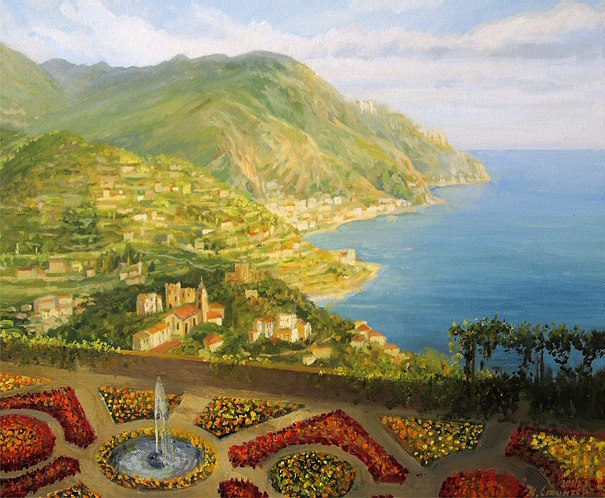 The walk in the gardens of Villa Rufolo in Ravello, Italy, fills you with divine beauty. A Stunning view stretching to the horizon, loaded me with inspiration and desire for life. 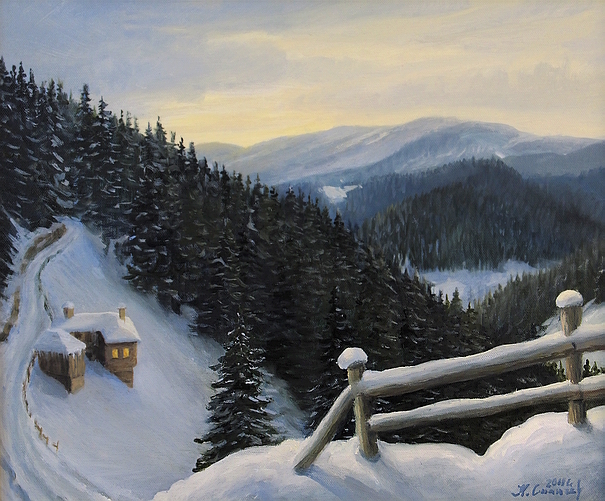 New painting is added to section "Private Possession", canvas named "Snowy Fairytale". Winter, in a manner, I believe all of us like it - sitting near the fireplace with the living fire, lost somewhere high in the mountains, far away from the hectic everyday city life. The story presents Zornitsa - pretty village scattered high on the slopes of the Rhodope Mountains. Wishing all friends a peaceful and filled with cozyness weekend! 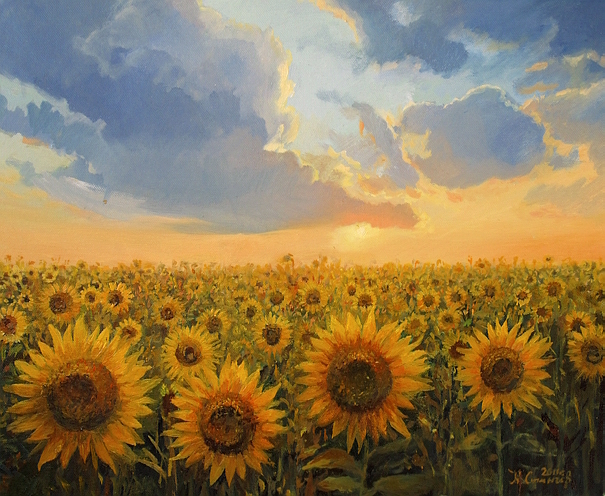 New painting is added to section "Available pictures", canvas named "Goodbye Summer". A few weeks ago I visited cape Kaliakra during the storm - hurricane winds, heavy overhanging clouds and barely caught light far into the sea, contrasting with the warm tones of the rocks covered with moss and dry, tall grasses spread around the cape. Wild beauty, loaded with subdued aggression, longing to be painted! Feel the beauty in everything, enjoy life and be yourself! 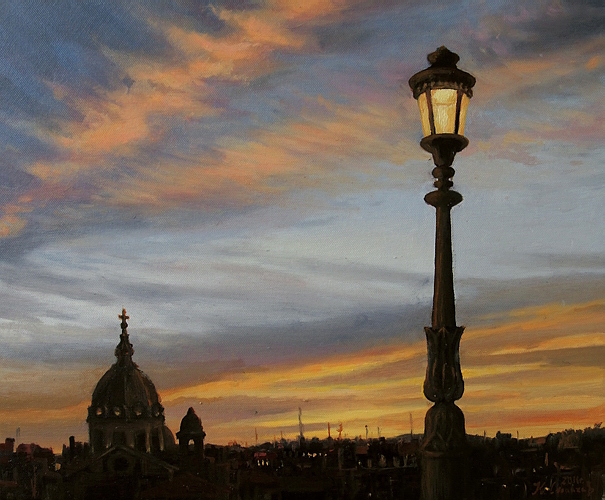 New painting is added to section "Available pictures", canvas named "City Lights". There is a moment with the oncoming sunset in which the city lights and heavenly colors of the sky are fighting for dominance over the landscape. This exact moment I've recreated with the canvas presented today - the Eternal City is preparing for another sleepless night and the sun fells asleep here to wake up another day at the far end of the Earth. Good morning friends! 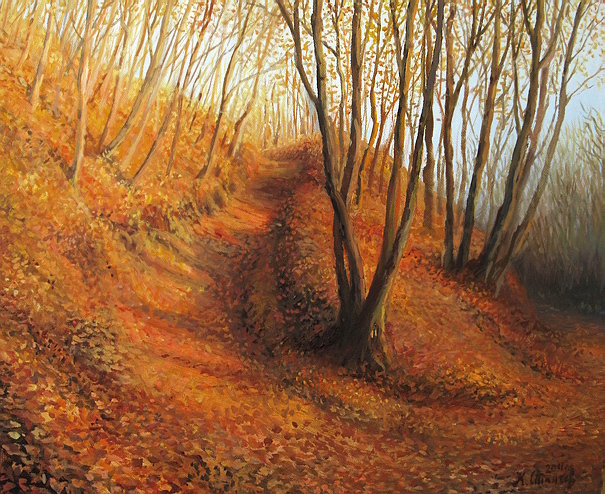 New painting is added to section "Available pictures", canvas named "Zheravna in The Autumn". In this dark and gloomy Monday, I'm presenting a sunny street from Jeravna. 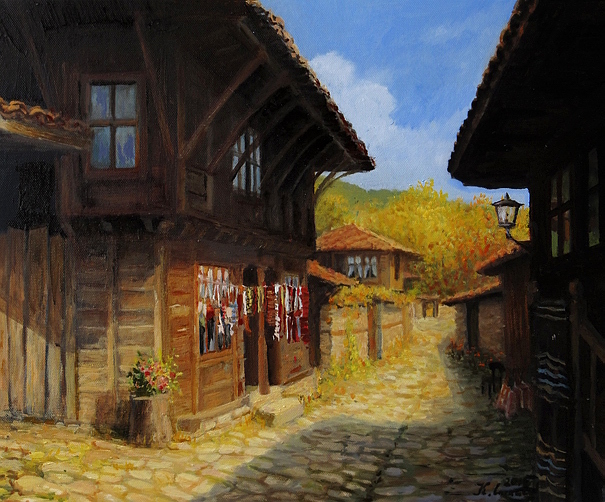 The warmth of the autumn dress of nature is complemented by the pallete of picturesque wooden houses, scattered on both sides of the cobbled road. New painting is added to section "Available pictures", canvas named "Sun Harmony". In today's gloomy weather, I'm offering the best "medicine" for the occasion - not just one, but countless suns shining in the light of the sunset. Let the warmth of the colors enlighten your week! 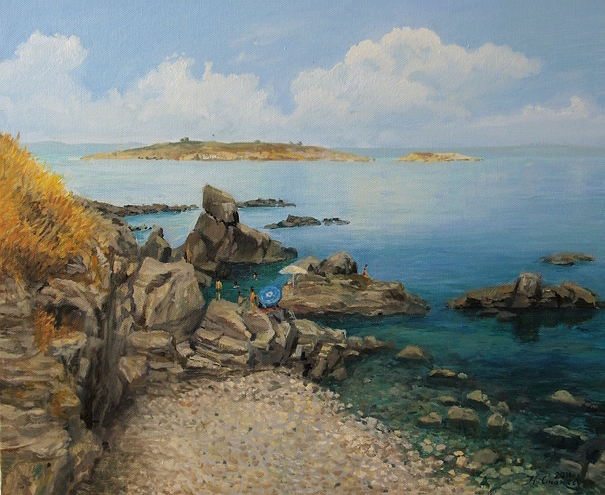 New painting is added to section "Available pictures", canvas named "On The Rocks in The Old Part of Sozopol". In the past 15 years I have never missed a visit to Sozopol and although coming back over and over, I always find something to surprise me. This year was fascinated by the smooth mirror-like water surface in a quiet August afternoon. Sunbathers on the rocks at the end of the peninsula were diving in crystal clear waters and the clouds cast a bright reflection in the sea - a nice memory from last summer. New painting is added to section "Available pictures", canvas named "Touched By The Sun". 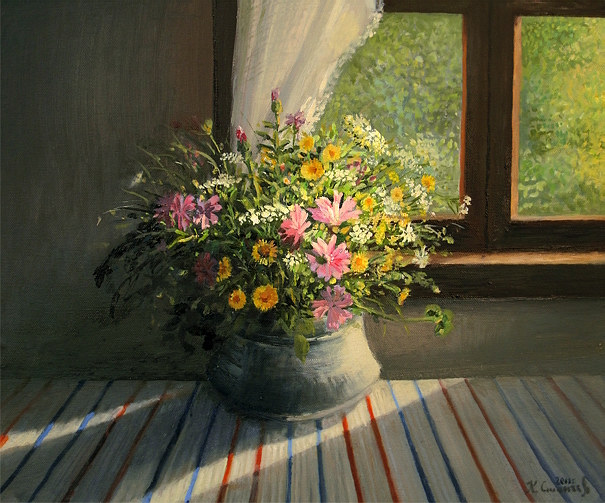 In the begining of the autumn I present a bouquet of field flowers, caressed by a sunbeam. By the light reflecting in the bouquet the whole room glowed in warm hues - a nice memory from the Balkan near Elena. Wishing you a nice weekend! New painting is added to section "Available pictures", canvas named "Late Afternoon In Bojenci". 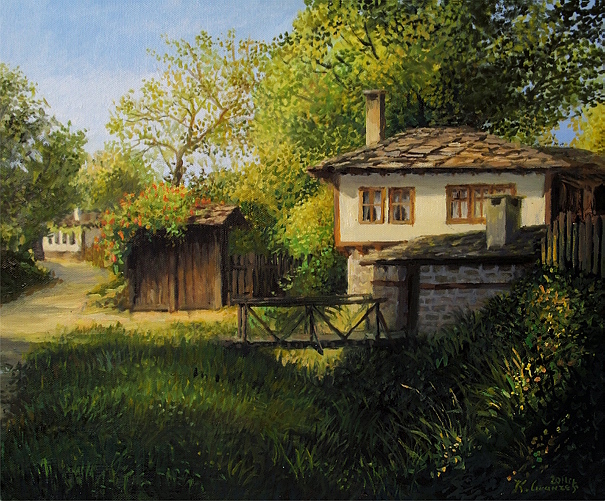 I like that Bojenci manages to preserve it's authentic look in which I remember the village from my childhood. Gladly I've noticed that the new houses in the village were built in the style of old buildings and does not irritate the eye. Perhaps this is the reason to return to Bojenci again and again over the years. Successful week everyone! 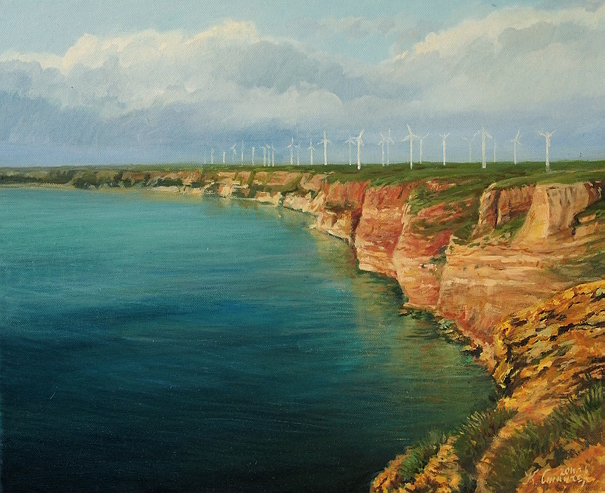 New painting is added to section "Available pictures", canvas named "Land of The Winds". 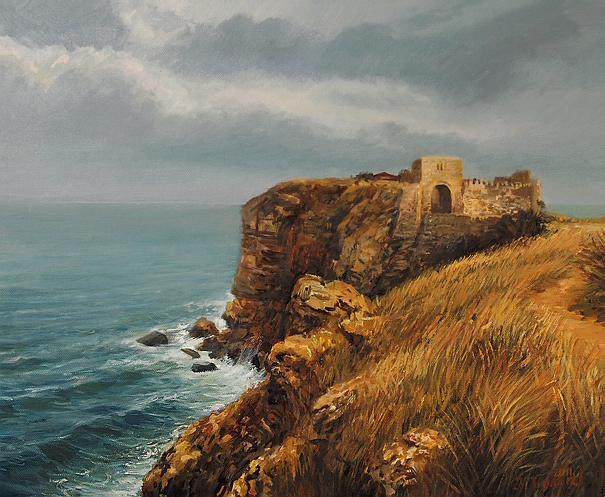 After a short summer break, today I'm presenting a canvas from Kaliakra. Strong winds on the cape especially in the beginning of autumn make visitor raise his arms as wings, ready to fly - a symbol of human longing for freedom. I wish you all an emotional weekend.